Madisonians and the Madison Arts Commission got full value from Brenda Baker’s willow and dogwood sculpture in Vilas Park, When Water Was Here. 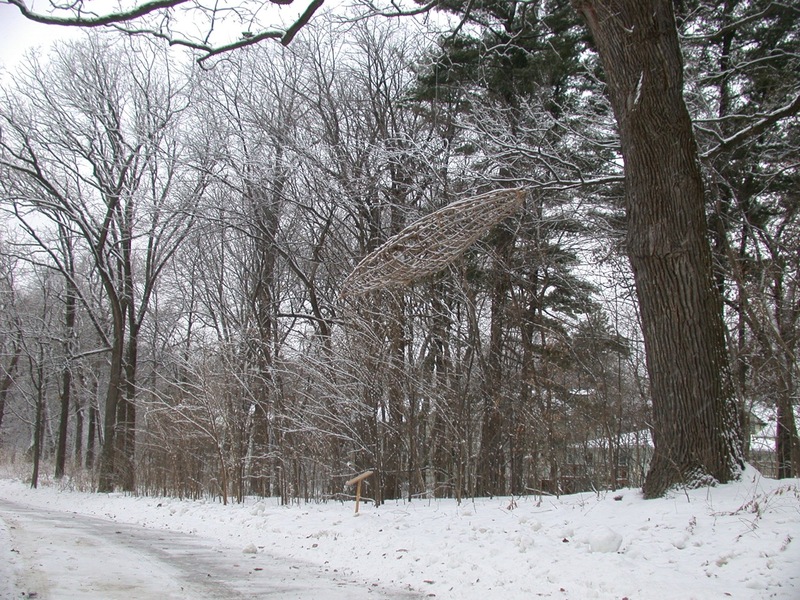 Planned as a six-month installation from Dec. 2007 to June 2008—from winter solstice to summer solstice—the art stayed in place until 2011. The fit of art and location was perfect. The canoe looked at home in the trees, seasonally harmonizing with the oak foliage or looming dramatically over the path. In the podcast below, listen to Brenda talk about deciding where to suspend the canoe, and other artistic and Wingra matters. Also listen to Unseen Madison favorite Charles Brown (as played by a voice actor who may be Gordon) describe the place before it was Vilas Park. This entry was posted on August 31, 2012 at 2:26 pm and is filed under audio. You can follow any responses to this entry through the RSS 2.0 feed. You can leave a response, or trackback from your own site.